The Nature Conservancy (TNC) and the Rhode Island Department of Environmental Management (DEM) are building nine small-scale, experimental reefs in Quonochontaug Pond. As part of a multiyear project, scientists seek to find out whether building oyster reefs in shallow coastal areas can improve the growth and survival of early life stages of recreationally important fish such as black sea bass, tautog, striped bass, scup, summer flounder and winter flounder. The underwater reefs are being built with steam-shucked surf clam shells, transported by barge from the Quonochontaug Fishing Area boat ramp to restoration sites at the far eastern and western ends of the pond. The sites were selected as suitable for oysters and close to high-quality, underutilized fish habitat. The new reefs will be covered with a layer of oyster shells and seeded with live oysters. State regulations prohibit oyster harvesting in Quonochontaug Pond, protecting the reefs and allowing for oyster propagation and growth. “Complex structures like oyster reefs are critically important for juvenile fish, providing excellent feeding areas and protecting them from open-water predators,” said Scott Comings, associate state director for TNC in Rhode Island. In October 2015, TNC and DEM built eight experimental reefs in Ninigret Pond. Scientists have since been monitoring the health of the Ninigret reefs, tracking natural recruitment of wild oysters, and recording the species of crabs, shrimp and fish that are attracted to them. The Quonochontaug Pond reefs will be added to the monitoring program this summer, with additional study to measure the comparative growth rates of different strains of seeded oysters. 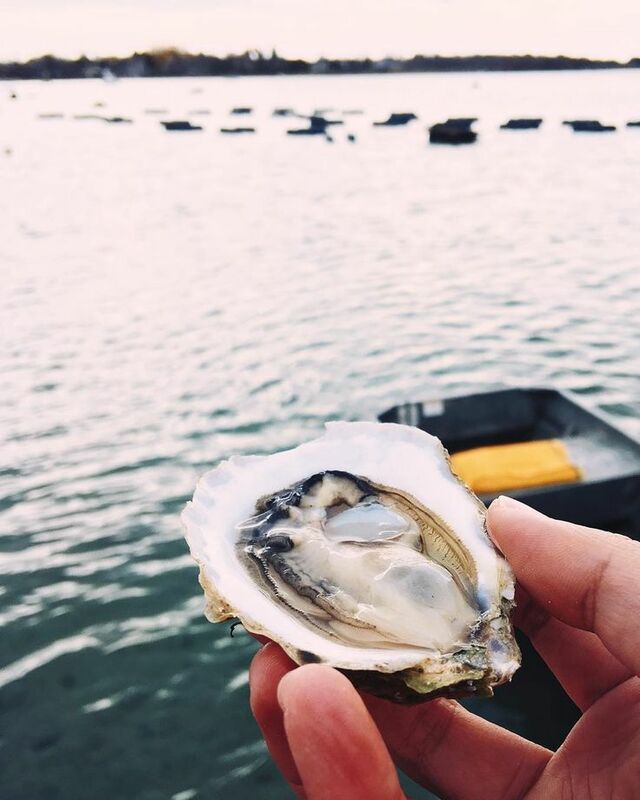 The project will evaluate whether oysters native to Green Hill Pond or the Narrow River estuary perform better than a hatchery strain commonly used in oyster restoration projects in coastal ponds. “Research in the Gulf of Mexico and Mid-Atlantic region has shown that constructing oyster reefs can increase fish and invertebrate biomass, as well as the growth and survival of recreationally important fish species,” said Eric Schneider, principal marine biologist for DEM Marine Fisheries. The practice of building reefs to enhance fish habitat with recycled shell has only recently been introduced in southern New England. The Ninigret and Quonochontaug reef projects will provide valuable information that will help future reef construction projects and contribute to a broader finfish restoration strategy for Rhode Island, according to state officials. This work is being conducted in collaboration with Jon Grabowski and Randall Hughes of Northeastern University’s Marine Science Center. They are assisting with design of the reefs, establishment of the monitoring protocol, and data analysis. In addition to enhancing the fish habitat in the coastal ponds, these reefs provide ecosystem services, such as improved water quality and clarity via nutrient uptake and sequestration, which complement aspects of the Rhode Island Shellfish Management Plan and the Rhode Island Shellfish Initiative. TNC and DEM pooled their resources to fund this project, with support from the U.S. Fish & Wildlife Service’s Sport Fish Restoration Program and individual donors.